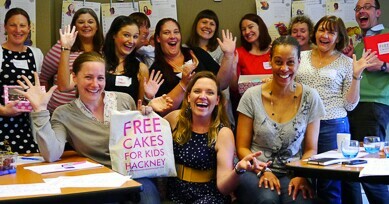 Back in June Free Cakes for Kids Hackney took a trip west to be part of the organisation’s annual network day in Bristol. It was kind of like a big family reunion (without your distant uncle making inappropriate jokes after one too many sherries). Representatives from FCFK branches all around the UK joined to share ideas – and cake – to see how we can improve the organisation and how we might be able to help each other out. We’re lucky in Hackney to have a great team of volunteer bakers, but some FCFK groups are less fortunate and might not have kept going without the support from the network. Realising that the FCFK family is spreading a little birthday magic to kids all over the country makes our work seem even more powerful and, quite frankly, impressive. We had food hygiene quizzes, talks on how to make the most out of social media, and break-away sessions on what’s next for our groups. But it wasn’t all hard work, there was also a cake tasting competition and three of our lovely Hackney bakers had their cake nominated for a best cake of all time prize. We’re already looking forward to next year’s reunion. But for now we’re excited about what we can achieve over the coming 12 months.